Parking lots on Grand Avenue and Wilshire Blvd. in downtown Los Angeles, May, 1946. A few businesses, such as Dawson's Book Shop (right) and Security First National Bank (left), are visible, as well as a billboard backing re-election for Republican Gov. Earl Warren. Warren helped create California’s highway system, which became a model for the U.S. interstate network. Photo courtesy of Los Angeles Public Library. 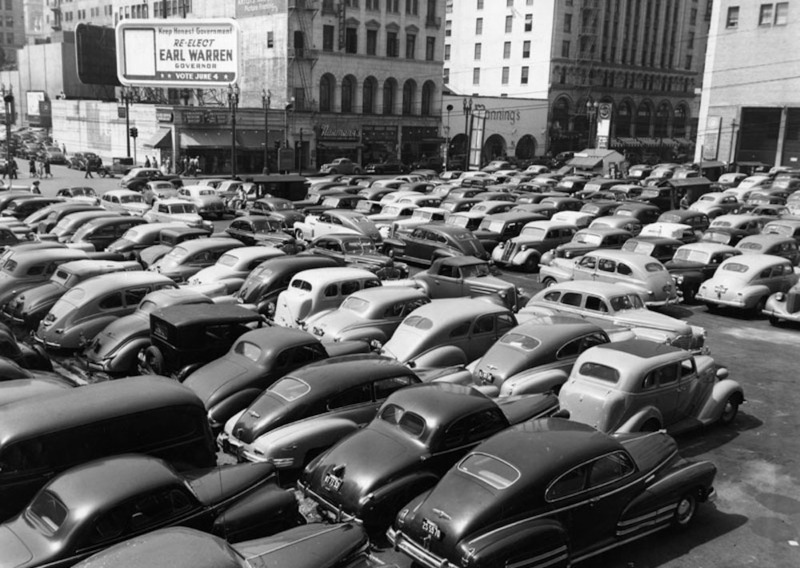 Southern California in particular already had a reputation for heavy reliance on the automobile before World War II, but neither the north nor the south had a road system that matched their car-oriented reputation. The absence of modern roads in California in the 1940s wasn’t due to lack of planning. There were plans gathering dust in drawers for a system of limited access highways with maps that look similar to what we have today. The problem in implementing these grand plans was the cost of building roads. You could float bonds to stretch out the expense. But eventually, the bonds had to be paid off. And apart from debt service, roads, once built, needed continuous funding for maintenance and repair. *An earlier version incorrectly referred to California State Senator Randolph Collier as Raymond Collier. Daniel J.B. Mitchell is professor-emeritus at UCLA Anderson School of Management and at UCLA Luskin School of Public Affairs.